Gina Sprint received a B.S. degree in computer science from Eastern Washington University, Cheney, WA, in 2012. Currently she is working toward the Ph.D. degree in computer science at Washington State University, Pullman, WA. 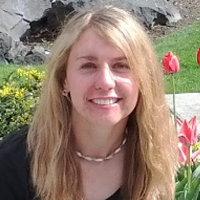 She is a National Science Foundation Fellow in the IGERT Integrative Training Program in Health-Assistive Smart Environments at Washington State University. Her research interests include wearable computing, machine learning, technology applications for healthcare, and computer science education. Today I attended the IOT and Emerging Tech session at the Grace Hopper Conference 2015. Gina Sprint spoke on wearable sensors for clinical outcome predictions. This is an extremely interesting topic. I also do research on mHealth so I am happy that I was able to attend her presentation. Gina went over 3 aspects of wearable rehabilitation. Why technology for rehabilitation:She explains there is objective data that can be used. Why ecological environments : They are more representative of abilities and resembles discharge environments. Her study is still on going. Most her participants are older. I was most interested in how she computes her data. She explained that she collects measurements from the body . She spoke on time stamp alignment, orientation correction, band pass filtering- to prevent noise and clinical assessments of process. Linear SVM,linear regression, random forest w/100 trees are some of the models she currently uses in her research. She states that their is obvious room for improvement of the accuracy of the models. If you would like to know more about her project contact her on Linkedin .